The builders left us a little welcome basket right after we closed. You would have thought it was filled with $20 bills with how excited I was. 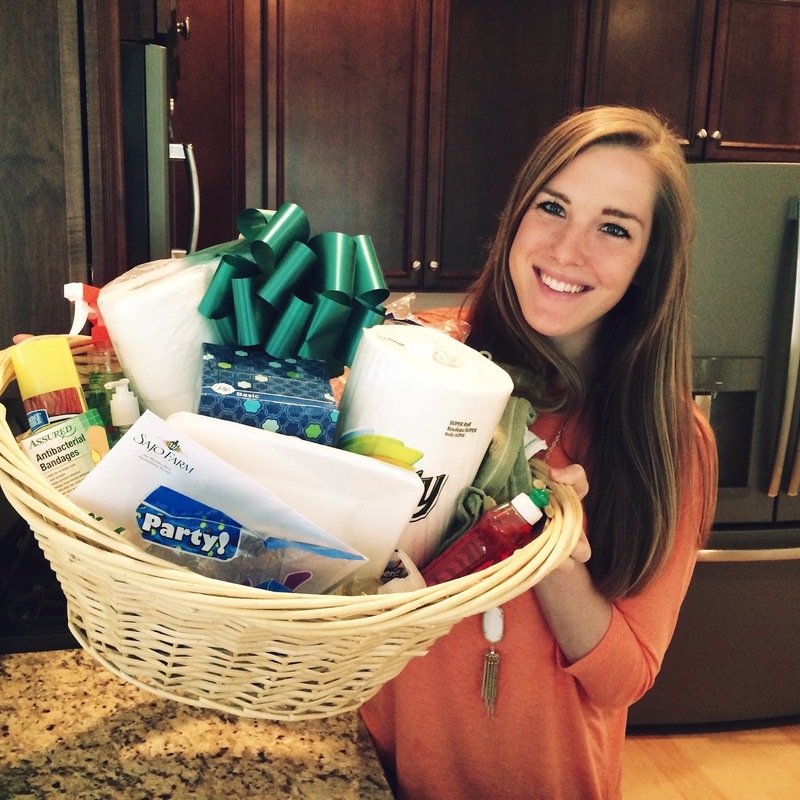 You know you are an adult when you get excited for free toilet paper and cleaning products. Thanks, home builders! Our entire house is an off-white, light ivory color, and we have gone back and forth 50 times on whether or not we want to paint. 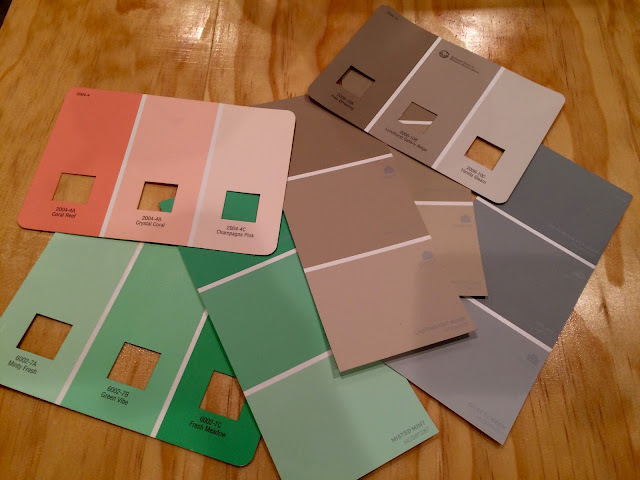 We grabbed a few paint samples to stare at (the mint and coral would be for my office, and the neutral colors would be for the main rooms), and we still haven't made a decision. To paint or not to paint, that is the question. 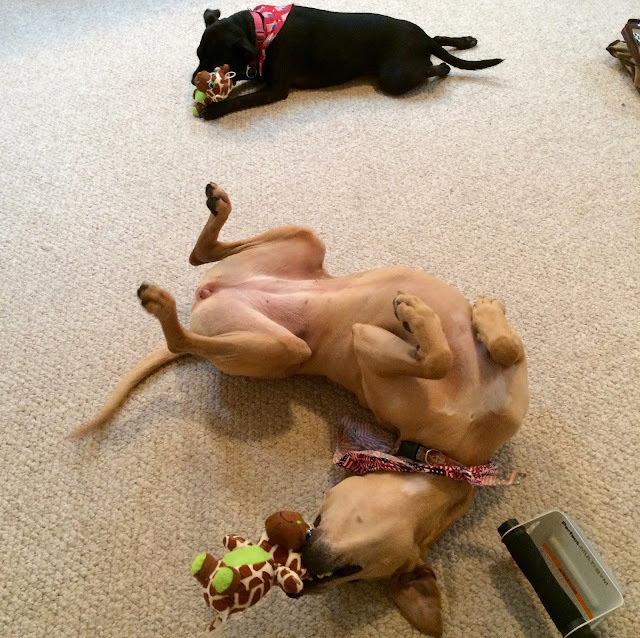 Jenny and Darla each got a "moving toy". Aka, I made up a reason to give them new toys. I love seeing how excited they get. Darla used to have pretty bad toy aggression, and she still is a toy hog, but she's come such a long way. I love seeing them so happy over these $3 toys that they will have de-fluffed in seconds. Since we were moving, it was project "eat everything in the refrigerator". These were the random things I found in my freezer that had been there who knows how long. Sometimes Parker will buy random frozen dinners that just sit in the freezer. Then, when it's time to move, we apparently finally get around to eating them. It was a buffet, frozen food style. We unpacked everything in 2.5 days, which is a personal record. It feels great to have it all unpacked! Our house is really starting to feel like home. 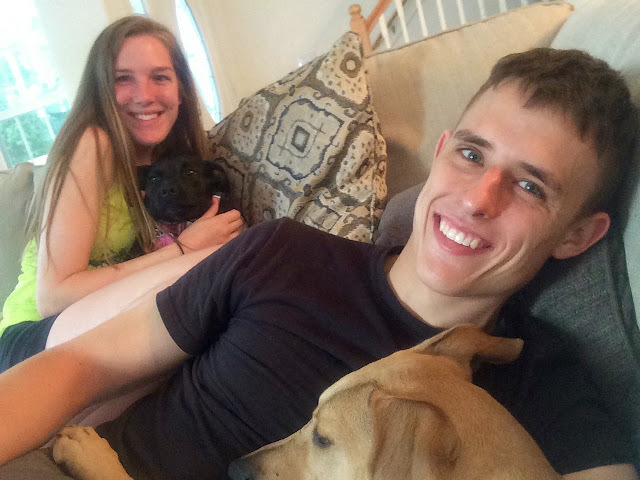 We snapped this picture after collapsing on the couch. Unpacking is no joke, friends! For how tired the dogs acted, you would have thought that they actually helped and didn't sleep the entire time. Ruff life, as usual. So that's life lately. It's busy, but it's good! #2 2.5 days unpacking...hushhhh that is awesomely crazy! 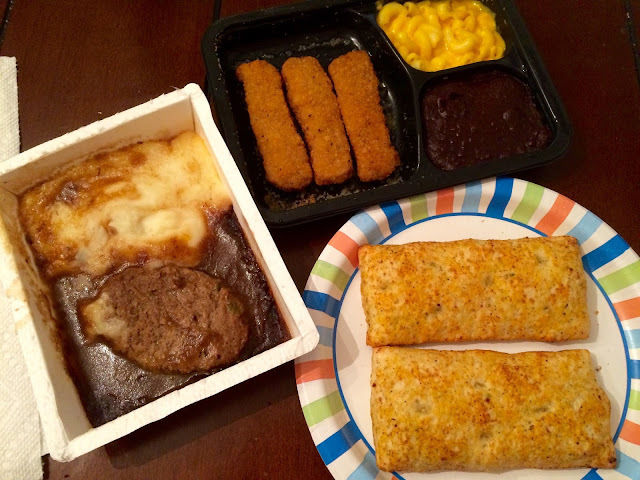 #3 frozen dinner buffet = winning!! your home builders are awesome to leave a little gift! At least that's my line of thinking. Yay for moving in!!! Send me your new address, please!!! TWO DAYS?!?! Holy cow! You go, girl! That's awesome. I wish I could ever unpack that quickly. I try to do it all within a week, haha. I love the colors you guys have picked out... can't wait to see what you decide on! 2 days!? I'm impressed! I'm lucky if I unpack within 2 months. My goal is to get it done in under a week with this PCS. And dude, that gift basket? AMAZING! Definitely paint! Your house will feel that much more like a home. And I'm glad we're not the only crazy-fast unpackers. One of my cousins moved like 4 months ago and is still living out of boxes. I want to go to Ohio and unpack for her. Granted that we've moved at least 4 times, we haven't accumulated that much stuff. And I thank our small place for that! But man 2 days,that's pretty awesome! Can't wait to see more of your casa! Yes to unpacking fast! I love the frozen meal buffet. Tom does the same thing about buying food and then forgetting about it. I guess it comes in handy though for these occasions.